Two states by Chetan Bhagat, talks about the cultures of north and south india. In between the two, there is this middle belt, which maintains the fine balance of north indian pompousness and south indian simplicity. Maharashtra state, is home to diverse groups which speak marathi as their first language. The state has regions with hill tops, coastal sides and flat terrains. The food and grains also differ from each area. And yet when you happen to meet maharashtrians, you may find all of them similar. Primarily it is the language that binds one and all. Most things would have a rule or protocol in all families and each love to say, this is our family's tradition. Every family is willing to judge the others on their skills of hospitality, cooking, cleanliness and many other things. You cannot simply please people by cooking delicious food. It has to be accompanied with right serving skills and knowledge of how much to serve and when. With time, ofcourse, things have eased out for most, and now people are happy to be invited for a meal. Maharashtrian thali, comprises of the state's staples. However, if the occassion is special, there are some food items that you ought to avoid. Also the way you arrange your food on the thali, is of great significance. 1) Arrangement of dishes - Each food item will have a specific location on the leaf. You always start serving with salt. Salt is placed in the centre and at the top. The position of 12 on the clock. Then you start serving the left hand side (daava) food items. The daavas, always include the supporting dishes like chutneys, nashta, achar,riata, papad and sweet. The right hand side (ujwa) always made of main course like vegetables, curries, rice and roti/ puri. For the second serving, you will be asked whether you need daava or ujwa, which means you want some more of left hand side items or right hand side? This practise could be because of the kamandalus segregated for vegetables or side dishes. Then serve the rice , topped with varan and ghee followed by other gravies or curries. You may then serve the sweet or puris. Normally people break fast by consuming rice first. Even when you have special rice varieties like masala bhat or pulav, the first serving will always be plain rice with varan and ghee. Most people like to end their meals with buttermilk or curd. 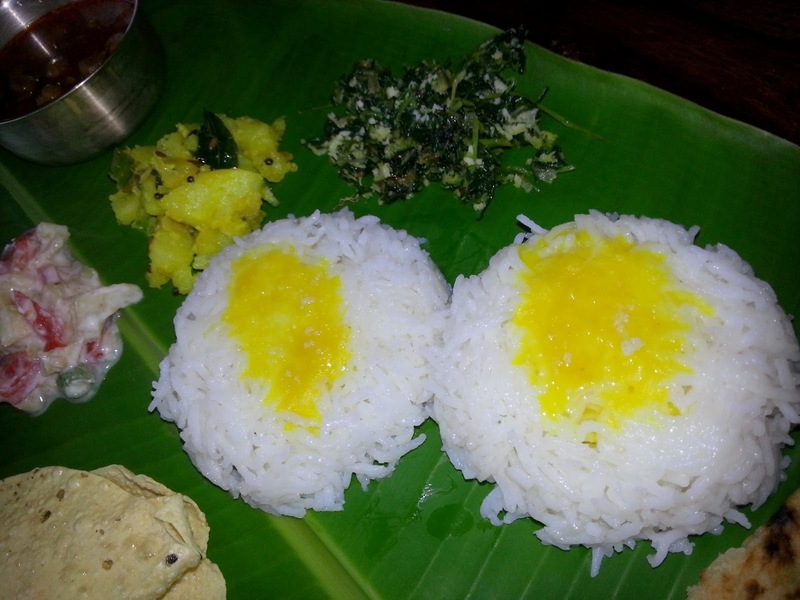 Rice serving- Usually rice is served in moulds even for large gatherings. It is not appreciated when plain rice is directly served on leaf. Topping it with plain dal (varan ) and ghee is implicit. This item is not asked for but served mandatory This should be smallest moulds so that people can later eat other food servings. By regions, the tradition of adding one mould or two differs. Most parts would serve 2 moulds of rice. Bread - Even when bhakri and zunka are declared as states staple food, they are never prepared for special occassions. It will be usually puris or phulkas (the former most of the times). If puranpoli is included on the menu, then no other flat bread is served that day. This is great Pradnya. Love the thali next time my kids ask me abt the placement etc they will be stuck in front of your post. Great one Pradnya. 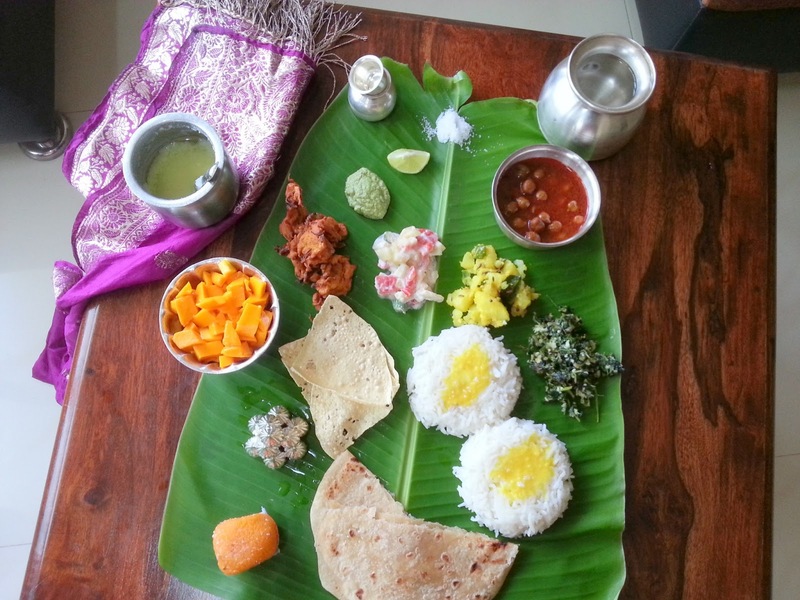 That is a very sumptous meal ..Love to eat the traditional meals on a banana leaf. Very interesting background on how the food is served. The order is different in our families. 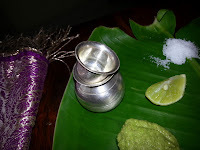 Very interesting post, love to read how the foods are serve in Maharashtiran Thali Prandya. Beautiful post. Hey , thats really nice ! 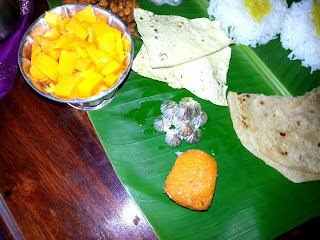 unfortunately I have never had food on a banana leaf ever, but would love to have it.. THis is more or less similar to the way we serve here in South. But for the leaf itself is kept so that the wider part (not the end) is onto your right side. So pickles end up on top left. Is it the same here, cos I am a tiny bit confused as to how will you sit facing the leaf? what should I say to this one..you have taught me how to display a Maharashtrian Thali...and I love the way you have given detailed explanation..super!! Very interesting to learn about the food customs & traditions in Maharashtra. what if i have to serve in a round steel thali ?